2. I can overlay data like grades, speed, elevation, etc. 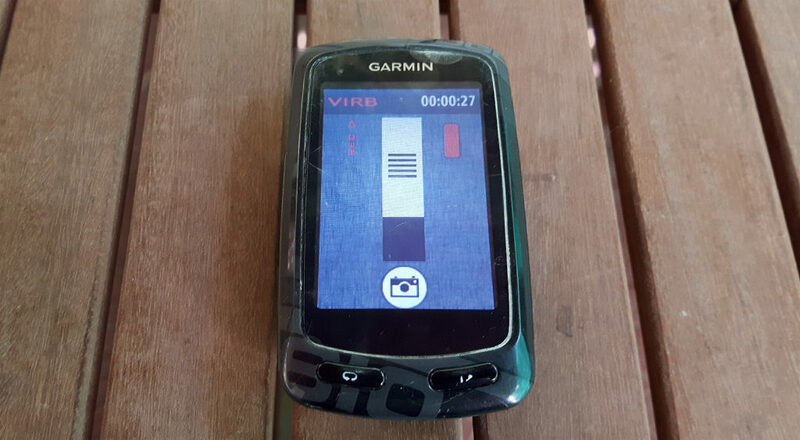 If you’d like to read a more in-depth review of the Garmin Virb Ultra 30, please check out this excellent review by DC Rainmaker. This blog post is about my first impressions after starting to use the Virb and about some issues I had with this camera regarding battery life and online video quality and how I solved them. 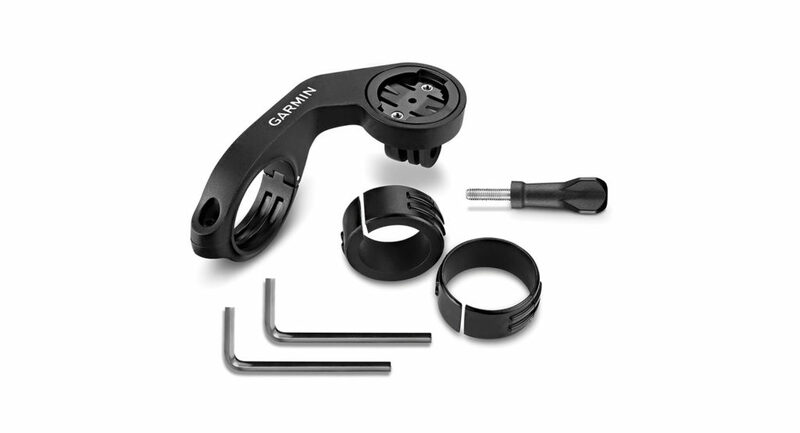 Garmin sells a handy Virb and Edge combi mount, so you don’t need a separate mount for your action camera. 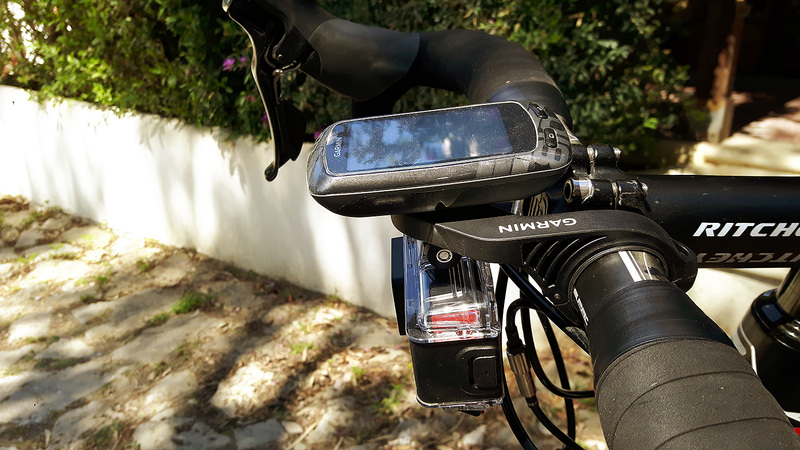 The top part is the same as the basic mount for the Edge, but underneath you’ll find the standard action cam connection, which also works with a GoPro. 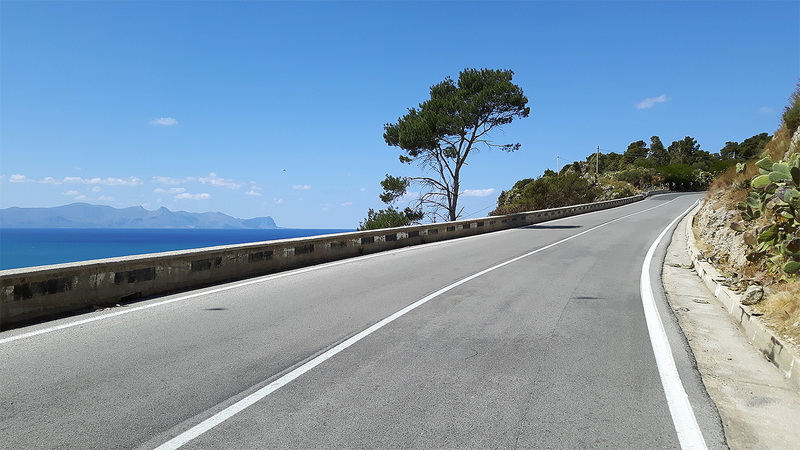 The azure blue sea is nowhere to be seen on the Virb footage, so in the future I’ll also use a chest strap and a helmet mount. Pairing the Garmin Virb Ultra 30 with the sensors on my bike was very easy. It didn’t take more than a few minutes. Controlling the camera with the Edge 810 is simple: on the remote control page you can either start a recording by swiping the record button up or take a picture by clicking on the camera icon. The first issue I had with the Virb Ultra 30 camera was the battery life. On the Garmin website it says “Battery life: Up to 2 hours 15 minutes at 1080p/30fps”, but with these settings, my battery only lasts for 1 hour and 55 minutes of continuous filming and so do the three additional official Garmin batteries I bought. Does the battery last longer when you record only parts of a ride by turning the camera on and off? Nope, it doesn’t! I’d expected to see a big difference, seeing that recording in a higher resolution and/or frame rate would also influence battery life, but it doesn’t matter at all whether you record continuously or only short clips: After two hours the battery is dead. What does make a difference, is turning the sensor pairing off. 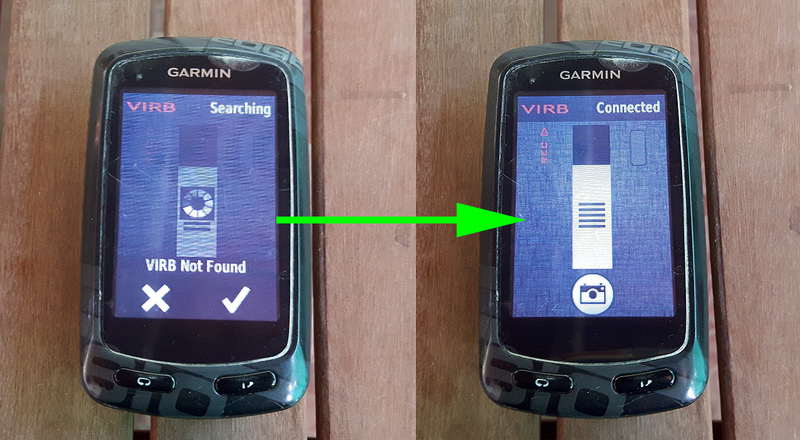 When the Virb Ultra 30 is not paired, the batteries last for 2 hours and 10 minutes, so more or less, what the Garmin specs say. So, if you bought the camera because you’d like to show speed, power, heart rate and more on your clips, keep in mind that this feature will cost about 15 minutes of battery life. Another way to safe battery life, is to turn the Virb off when you don’t need it using the on/off button on the camera itself. 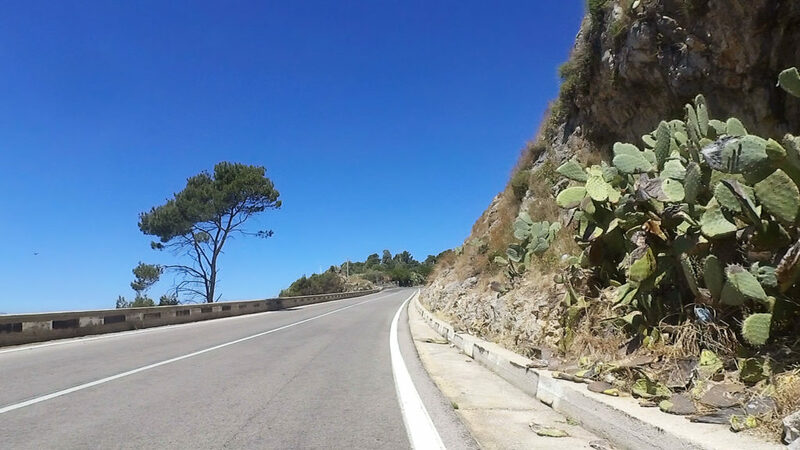 So, now when I’d like to record a certain area where I haven’t filmed before, I keep the camera off until I arrive there and only then I turn it on. I don’t have to look for LED lights on the camera to be sure that the camera is turned on, because my Edge will show me a “Virb connected” message. On the left: Virb turned off. On the right: Virb turned on and connected. To avoid ending up with a drained battery, I now make sure I bring an extra battery (or extra batteries on longer rides), so I can record everything I want. While my editing skills are open for discussion (I’m still learning), we can all agree that that video quality hurts your eyes… I know that Youtube compresses uploaded videos, but the difference between the crisp offline and the pixelated online version is huge. I bought the camera so I could upload some nice footage to Youtube, so what’s the use when you get these terrible results online? I then tried everything to improve the online quality of that particular video. I exported the video in Premiere with tens of different export settings, including the “best export settings for Youtube” (as can be found on Youtube), but nothing changed: on my laptop they all looked great, but once uploaded to Youtube and Vimeo, the quality sucked. Even the unedited version (straight from the camera) looked terrible online. So I concluded that there was an issue with the original footage. But how could I fix that? “Flatter color profile with higher dynamic range, allowing for more flexibility in post-processing”. Based on the text in the manual I had set my Virb to vivid colors, because the footage can be quite flat. This however, apparently means that you’re filming with a lower dynamic range. As you can see, there’s no real difference between the original footage straight from the memory card and the exported version made with the Virb Edit software. I want to know how can I put seconds on the hour for the video. The GAUGES hour only shows hour and minute, I would like to have seconds too. How can I have that, please? The time of day is only shown in hours and minutes, but lap time should show seconds as well. I haven’t made lap videos yet, so I haven’ been able to test that.